What are the advantages of steel structure warehouses compared to ordinary warehouses? Nowadays, steel structure warehouse has replaced the traditional warehouse gradually. 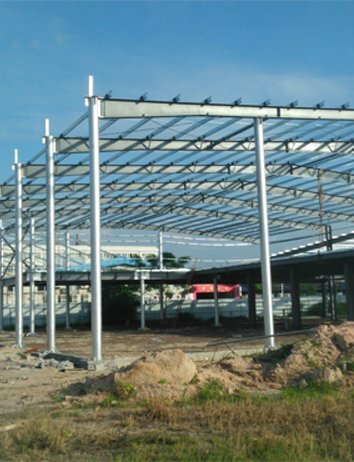 The advantages of steel structure warehouse are clear, whether the performance of shockproof or fire resistance, even the wind resistant performance is very good. And the rugged design of the structure, the new eco-friendly building materials to build a warehouse, also won so many entrepreneurs’ love. Using light steel to build up a steel structure warehouse also plays a role of environmental protection, because the waste of water and soil resources consume far less than traditional cement warehouse consumption. But in such a building which materials are the use of the most environmentally friendly materials on the market currently, called color steel plates. So this will play for a very good environment protection as well as the entire building groups. And this kind of building materials in today's society are the most popular mainstream building materials and pro-gaze undoubtedly , a lot of relatively old export will adopt to reinforce it, so its thermal insulation effect is very significant, and put things inside won’t worry about any problems. Therefore, strengthen the protection of its main building for steel structure warehouse to protect the light steel structure won’t cause any external temperature difference, because the different temperature between the outside light steel structure arising from any of the problems, which has reached the corrosion insulation effect and prolong its service life. Nowadays, with the society develop rapidly, many companies want to come to the tip of the times, so they choose steel structure warehouse as their own business warehouse, not only looks attractive but also useful. In a word, no matter how the construction industry will develop in the future, steel structure warehouses can occupy a stable position in this competitive market.